Boogie Man Journal: April 20 1914: On this day 97 years ago the US government machine gunned it's own citizens who had the nerve to want some basic human rights. April 20 1914: On this day 97 years ago the US government machine gunned it's own citizens who had the nerve to want some basic human rights. The Ludlow Massacre resulted in the violent deaths of 19 people during an attack by the Colorado National Guard on a tent colony of 1,200 striking coal miners and their families at Ludlow, Colorado on April 20, 1914. The deaths occurred after a day-long fight between strikers and the Guard. Two women and eleven children were asphyxiated and burned to death. Three union leaders and two strikers were killed by gunfire, along with one child, one passer-by, and one National Guardsman. In response, the miners armed themselves and attacked dozens of mines, destroying property and engaging in several skirmishes with the Colorado National Guard. This was the deadliest incident in the 14-month 1913-1914 southern Colorado Coal Strike, itself the deadliest strike in the history of the United States. 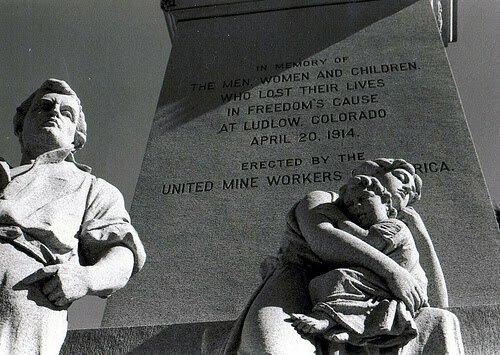 The strike was organized by the United Mine Workers of America (UMWA) against coal mining companies in Colorado. The three largest companies involved were the Rockefeller family-owned Colorado Fuel & Iron Company (CF&I), the Rocky Mountain Fuel Company (RMF), and the Victor-American Fuel Company (VAF). Ludlow, located 12 miles northwest of Trinidad, Colorado, is now a ghost town. The massacre site is owned by the UMWA, which erected a granite monument in memory of the miners and their families who died that day.